So, where did I leave you in part 1? On tenderhooks no doubt!! As I recall, I had exited the swim and was getting changed for my bike leg. This involved peeling off the rest of my wetsuit, putting on a cycle top, my cycle shoes, gloves and race belt (already stocked with 4 energy gels and some energy bars) before putting my wetsuit, goggles and swim cap into my bike bag. I took a few sips from a bottle of energy drink that I’d left in the transition bag and ran out of the changing tent to search for my bike. I’d counted how many rows I’d have to run past to get to it and found it fairly easily as there were far fewer bikes in transition as I arrived. I got to my bike and put my helmet on before touching the bike (a golden rule of triathlon) and then unhooked my bike and ran out to the mount line. Safely past it, I climbed on and cycled off. Within seconds, my knee started rubbing the edge of one of the energy gel wrappers. 4 hours of that and it would have cut me to the bone. The first bit of the cycle leg was flat but once I reached the end of the run turnaround point, the cycle route started a gradual climb away from the sea. It was pretty easy and my legs felt fresh. I’d done lots of kicking as I swam to the shore to try and get the blood circulating as much as possible so that I wouldn’t have trouble getting upright and this had certainly woken them up ready for the run. The climb lasted for almost 10K and peaked at 168m (from sea-level). There were some rather challenging sections including Ridgeway and the desire to get off and walk up one incline did cross my mind but I kept on pedaling and pedaling. Onwards and upwards. Ever upwards! It felt great to get to the top and to know that was the worst climb of the route over. I’d made it that far and there was no going back. I’ll not bother to describe the course as the map above does a much better job than I can. Given that we were going clockwise, I was surprised at how many left turns there were. The course was very well managed with marshals at every junction and no issues with other traffic. I had right-of-way at every junction and roundabout. At about 1/3 of the way, there was an out and back section that was quite narrow in places. In fact, there had been a collision at one point half way along and an ambulance was on scene. That meant stopping to let other cyclists from the other direction through. Once I got to the turnaround point, I headed back southwards and soon saw Tamsyn and, shortly behind her, Jan. Tamsyn had done a great job of catching up as her swim wave started 5 minutes after mine. My goal was to try and keep her behind me for the rest of the cycle course! The next section was pretty flat. I hit the half-way mark in about 2 hours and 5 minutes. Slightly behind schedule but given the first half of the course had more ascents than descents, that was fine. There still appeared to be too many left hand turns and I was wondering whether some of the signs had been misplaced at one point! My hips were starting to ache and I was getting saddle sore. It felt good to be over half way around the course but I can’t say that I was enjoying the ride too much. The weather was good though and there wasn’t any wind to write home about so I really couldn’t complain. I took any opportunity to stretch and get out of the saddle that I could. Once I’d got close to Wareham, I knew the roads we’d be taking most of the way back to Weymouth. I’d struggled on them on the ride with Chris but that was largely due to the fact that at that time I’d cycled about 60 miles already. I tried to recall if there were any really challenging ascents but couldn’t remember any. On the ride, I kept taking energy gels about every 30-40 minutes and downed 1500ml of water/energy drinks over the whole duration of the cycle leg. I should have probably had more of the latter but did the best I could. They say that it’s far better to hydrate on the bike than the run. Advice duly heeded. Soon I passed a sign showing that Weymouth was 12 miles away. My Garmin suggested it was 9. I was hoping the Garmin was right. 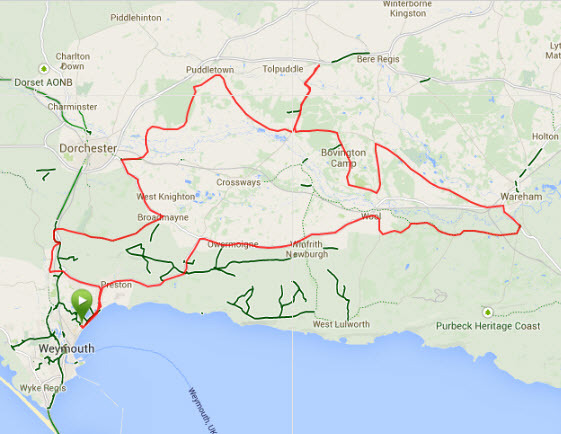 The rest of the ride was uneventful apart from seeing another sign saying Weymouth was 7 miles. I hoped it was 4! It turned out the Garmin was right and before I knew it, there was a roundabout where there was a choice of returning to T2 or starting a 2nd lap of the bike course (for those doing the full Ironman distance). I followed the signs to T2 and immediately questioned myself as to whether that was right. It was! Phew! Before I knew it, I was back on the road that ran parallel to the promenade and Lodmoor Park was visible in the distance. I glanced across to the Prom to see runners. I’d get my chance before long. My hips were still achy and I wasn’t really looking forward to a 25km run. I turned into Lodmoor Park and rode to the dismount line. Having successfully unclipped, I handed by bike to a stranger in the vague hope that I may never see it again! Once we parted ways, I found my ‘run’ transition bag and headed back into the change tent to remove my cycle gear (helmet, gloves and shoes) and put on my cap and running shoes. As I’d entered the tent, I’d seen Tamsyn roll in on her bike. She’d caught me up on the cycle. I gave her some words of encouragement and as I got ready for my run saw Tamsyn run out onto the final leg of her event ahead of me. I hoped that I’d be able to keep her in my sights for the rest of the run. I could go into great detail about the run but it wasn’t pleasant! My hips were aching. Seeing almost the full distance we had to run from one end of promenade to the Pavilion and back wasn’t much fun!! Also, I’d forgotten two things in transition. Firstly, I’d left my cycling top on and was sweltering. Also, I’d forgotten to put socks on and almost immediately into the run I could feel sore spots developing on each instep. I have to say that the combination wasn’t great and it wasn’t long before I was taking regular walk breaks. This was going to be tough. The thing that kept me going was seeing friends out on the course as well as Eleanore, Katherine, Ant and Lyndsey who were supporting us and lots of very supportive locals (including ex-work colleague Sandy and his wife). With our names on our race numbers, it was great to hear personal shouts of encouragement along the way. The run course was 2 and a half laps. The first 1/2 lap was from Lodmoor to the Pavilion and then then two laps from the Pavilion to the turnaround point and back. I have to say that had there been an opportunity for a short-cut I would have been tempted to take it at various points during the run but with timing mats at either end, that wasn’t a viable option!!! Darn!! 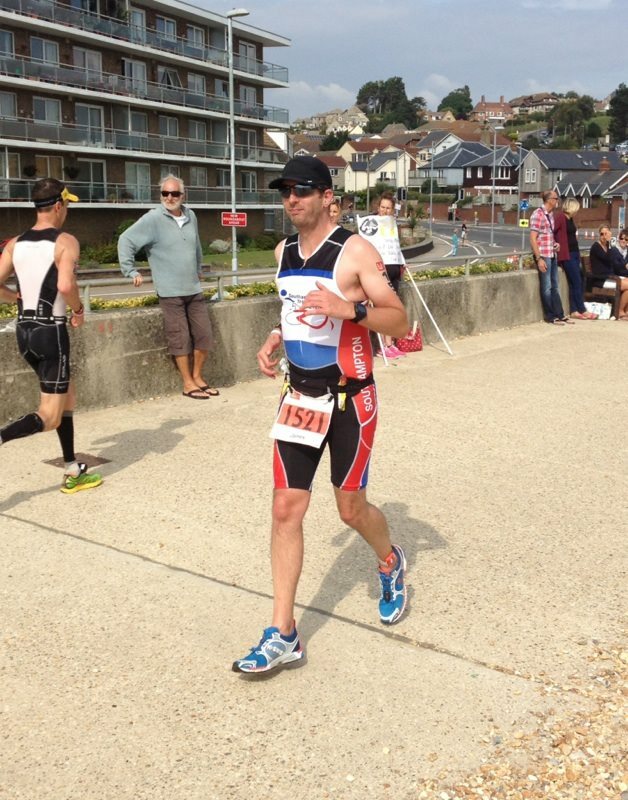 Having completed 2 laps, I was back at the swim start at Lodmoor and was heading to the finish. I’d refueled at every water station on the run course but missed out the last opportunity as I wanted to hit my 2:30 target. I’d like to say that I’d paced it perfectly as I crossed the line in 2:30:08 but the reality was that the course wasn’t the advertised 25km but closer to the correct half marathon distance of 21km. I’d paced myself for a 25km run rather than a half-marathon though. I’ve no idea why the Race Director thought it was 4km longer than it actually was. That can’t be accounted for by GPS errors even on a 2.5 lap course. However, it does make me wonder whether the full distance run was the correct length. Overall, I was just shy of 4 minutes outside my goal time (forgetting that the run course was shorter than expected!) I was very happy to complete the course and staggered up the steps into the Pavilion to collect my race T-shirt. I was greeted by Tamsyn who was recovering from her excellent performance having finished in 07:24:54. Well done Tamsyn. Having chatted with Tamsyn and James for a while, I headed out as I had to get to Denise’s parents to pick up the boys to get them home to bed before it was too late. As I left the Pavilion, I spotted Eleanore and then chatted with Gary, Roelie and James for a few minutes before heading back along the promenade to Lodmoor to pick up my bike and head home. 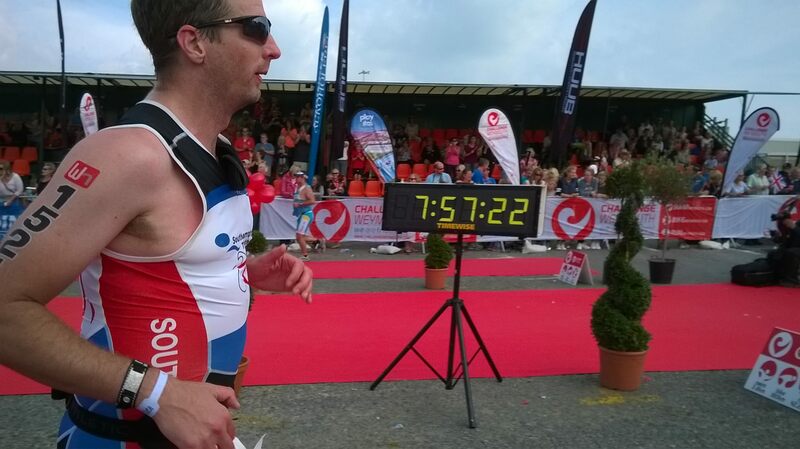 Half Ironman distance triathlon completed. Happy! I could have gone faster. That’ll have to wait until next year though. More training. Longer runs. More time on the bike tackling more hills. Lots to do! Just need to find the time!! In hindsight, I really enjoyed the event. It was really well organised. I couldn’t have chosen a better located hotel. It was great to have so many triathlon friends at the event. The bike course was challenging but not unduly so. The sea was far worse than I expected but I now know that I could swim in pretty much any conditions! The run was great because there were so many spectators along the course and lots of opportunity to see friends as we went backwards and forwards along the prom. Would I consider a full Ironman now? Not a chance!! I simply don’t have the time to commit to the training and don’t think I’d manage a marathon after a 3.8km swim and a 180km bike ride. Maybe one day. Until that day, I’m considering a marathon for next year but am not committing to one! I’d like to do some more half distance events too. Have a couple in mind. Maybe Weymouth again as it’s close to home. Anyone fancy joining me?